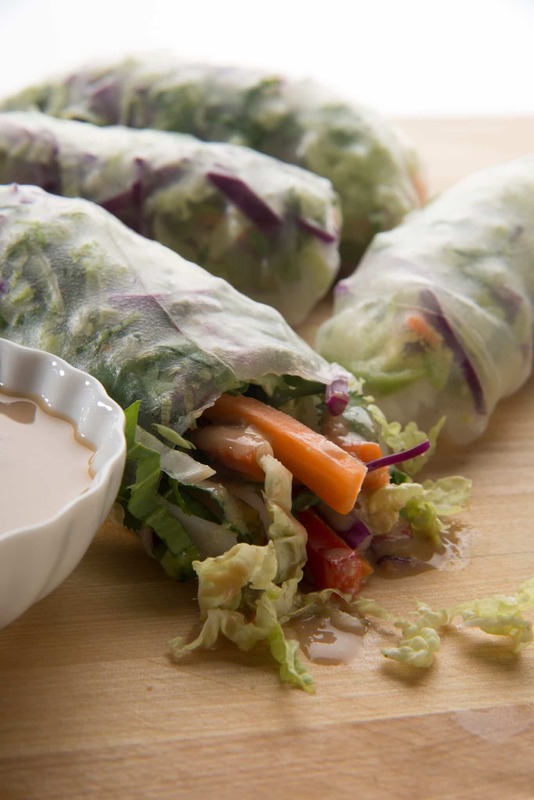 I’ve been talking about how it’s too hot to cook and I have the perfect summer dinner recipe for you – Pad Thai Spring Rolls from Sweet Debbie’s Organic Cupcakes new cookbook, Sweet, Savory & Free. You do need to boil the brown rice noodles and I suggest that you do that early in the morning or the night before to keep your kitchen cool. The roll wrappers just get dipped in warm water before you assemble it all, so you don’t need to do those ahead. Debbie owns a vegan, allergy-free, gluten-free and sugar-free bakery in Los Angeles called Sweet Debbie’s Organic Cupcakes. 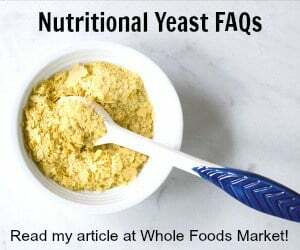 All of her recipes are free of the top 8 food allergens, in addition to gluten-free, sesame-free, and refined sugar. Her recipes in this book are also refined oil-free as well – even her baked goods. In her first book, Sweet Debbie’s Organic Treats, all her recipes were sweet ones and in this one she has mostly savory with a few sweets thrown in for good measure. The chapters include what you need equipment-wise in your kitchen, staples recipes, morning munchies, soup is good food, meals in muffin tins and ramekins, pizza pasta rice & noodles, the main attraction, the side show, the bread basket, and a feast of sweets. I can’t wait to try some of the ramekin recipes in my air fryer! Note that you can get brown rice wrappers in health food stores or on Amazon. You can also get brown rice pad Thai noodles on Amazon, and lately I’ve found some red rice noodles at Aldi’s for cheap! 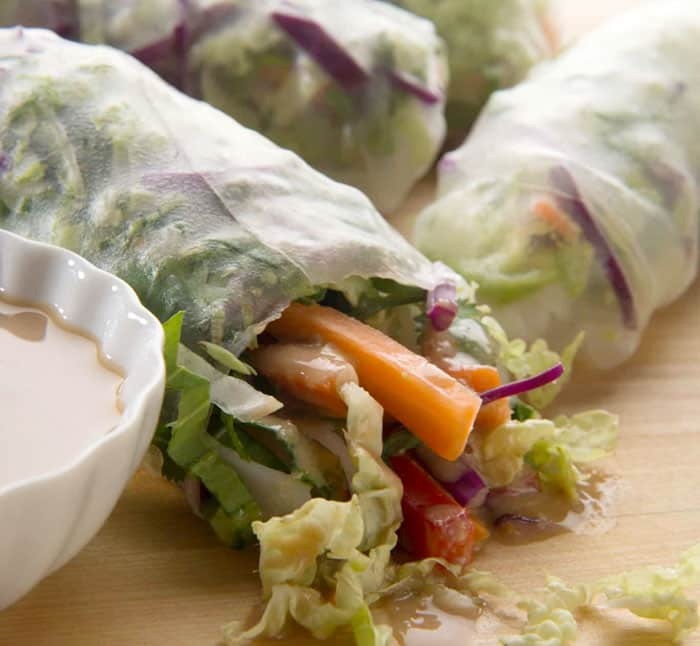 Enjoy these Pad Thai Rolls and staying cool this summer! Mix al the dressing ingredients together and set aside. Bring a large pot of water to boil. Cook the pad Thai noodles according to package instructions. Drain and rinse the noodles. To make the dressing; Combine the miso, ginger, garlic, tea, coconut aminos, maple syrup, vinegar, mirin, and red pepper flakes in a small bowl. Stir well. To make the Spring rolls; Pour warm water into a 9-inch cake pan. Place one rice paper wrap in the water and let it sit until it softens, about 1 minute. If it curls just push it back down into the water. Place the wrap on a plate and add some mixed greens, cilantro, carrot, cucumber, bell pepper and avocado in the center. Add about 2 tablespoons of pad Thai noodles and pour about 1 tablespoon of the miso dressing on top. Fold in the right and left sides of the wrap and then roll up the side nearest to you until it’s closed. Continue to fill and roll the rest of the wrappers. The dressing can also be used as a dip. I don’t drink regular tea. Do you think it would be okay to use water instead? I don’t drink tea either, Martha. Wondering what can be a sub for it? You could use a decaf tea or maybe try vegetable broth.